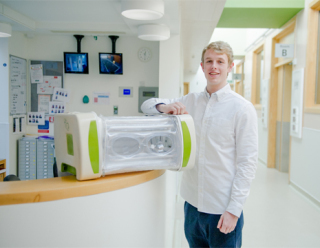 2014 James Dyson Award Winner, James Roberts, with his inflatable incubator, MOM: image via jamesdysonaward.orgCollege students and recent graduates are invited to submit their problem-solving designs and inventions to the 2015 James Dyson Award competition. Undergraduate and graduate design and/or engineering students, as well as those who have graduated from a design or engineering program within the past four years, are invited to enter this world reknowned competition. Currently accepting individual and team entries from 20 countries, The James Dyson Foundation has been encouraging and honoring next generation designers and engineers with financial, technical, and development support for their ideas since 2007. The competitions will begin in each of the 20 participating countries, which will pick their top innovators to compete worldwide. The winning entries at each level are rewarded for their significance, practicality, commercial viability, and sustainability, as well as novelty of engineering design. The Grand Prize is $45,000 to the winner plus a financial reward to his or her school, and several other awards to winners of lower tiers. The 2014 Foundation Award went to a British graduate of Loughborough University, James Roberts (pictured top right), who created a low-cost inflatable incubator for the developing world called MOM. His $45,000 prize money went to further MOM's development for the millions of mothers who don't have access to the sophisticated (and very expensive) electronic incubators used in developed countries. MOM, as well as many other brilliantly designed solutions submitted to the Dyson Award challenges in the past (see Projects and Trailblazers), is inspirational and a must-see for anyone thinking of applying for the Award in 2015 or in a future year. For further information about eligibility, submission stages and calendar, financial awards, and other aspects of the competition, see the FAQ page at the James Dyson Award website.